Getting pelted with tomatoes may sound like a punishment reserved for medieval rogues in the stocks but it’s all in the name of fun at La Tomatina. 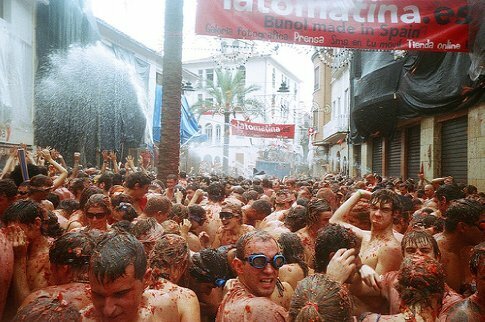 For one morning a year, the small town of Bunol in eastern Spain dissolves into the world’s greatest tomato fight. Some 140 tonnes of the squishy red beauties are trucked in for the running battle, which is concentrated around Plaza del Pueblo and attracts 30,000 visitors. La Tomatina began in 1945, possibly as an anti-Franco protest or simply as a food fight between friends. When the red riot is over, peace and cleanliness quickly return to Bunol. Fire trucks hose down the rabble and shopkeepers remove splattered plastic sheets from their stores. not be the only bruised bodies in town. Local Attractions: During the week before the scrap, Bunol hosts a paella cook-off and various festivities and fireworks. The best place to stay is nearby Valencia.